As part of a blogger outreach program for National Nutrition Month, Certified Steak and Seafood provided me and and other food bloggers with complimentary CSS products and invited us to create recipes to be featured on the company's Facebook page. 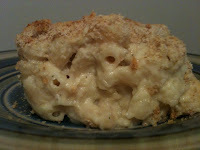 Here's the first of my recipes! · 24 hours in advance, if possible, pierce steaks with a knife and place in a zippable plastic bag with some reduced-sodium soy sauce to marinate. Be sure to squeeze all of the air out of the bag before sealing. · One at a time, place steaks into a heavy plastic bag and pound it with the flat side of a meat tenderizer. (If you don’t have a tenderizer, the bottom of a heavy frying pan may work.) Pound steaks to a uniform thickness; do not pound them thin. · Cut steaks across the grain into 1” wide strips. · In a pan over 70% to 80% heat, cook the strips for about 2 minutes on each side, then reduce heat slightly and cook for about 5 more minutes, stirring occasionally. Remove cooked strips from the pan and set them aside to rest. · Remove any residue from the pan. · Add olive oil to pan and set burner to 80% heat. · When olive oil has heated for about a minute, add onion, garlic, mushrooms, bean sprouts, soy sauce, hoisin sauce, ginger, and rice vinegar. 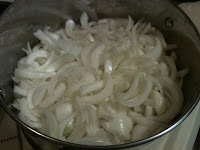 · When mushrooms and onions are tender (3-5 minutes), add water chestnuts and green onions; mix well. · Cut steak strips into 1/4" thick squares and add to pan. · Remove pan from heat. · Add sesame oil. If mixture is loose, add a bit of cornstarch to thicken. 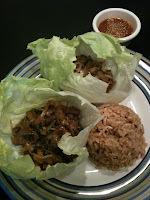 · Scoop mixture into lettuce leaf cups; drizzle with sauce if desired. · Dissolve sugar in 1/2 cup hot water. · Add soy sauce, rice vinegar, chili sauce, lemon juice and sesame oil; mix well. · In a separate dish, combine 2 tsp hot water with hot mustard; mix well. · Add mustard/water mixture and garlic and red chile paste to the rest of the mixture; mix well. NOTE: Sauce recipe is a slightly modified version of a popular recipe found throughout the Internet. So, I was recently introduced to a local store's electronic coupon program. As I sorted through the e-coupons and chose the ones I wanted, I noticed a coupon for frozen pizza rolls. Ahh, pizza rolls. Comfort food extraordinaire. One of those things you sometimes crave uncontrollably as you stroll through the frozen food section. I won't lie; I've eaten a few pizza rolls in my day (especially in college). Instead of downloading the e-coupon, I decided to try making my own pizza rolls. Have you figured out yet that I like a challenge? Personally, I enjoy a loaded pizza roll -- sausage, pepperoni, onions and green peppers. So that's what I set out to make, looking for opportunities to cut calories in the process. I bought homemade bulk sausage (pork breakfast sausage) from a local meat market, which I drained and pressed after cooking to extract as much fat as possible. I also opted for turkey pepperoni, which has far less fat than regular pepperoni. And instead of pizza sauce, I selected a smooth, veggie-filled pasta sauce, new Prego Veggie Smart Smooth & Simple. Assembling the pizza rolls is easy; the process is basically identical to putting together the Southwest Egg Rolls. However, I decided to try a new technique for baking the rolls: Coating them with a bit of olive oil on all exposed surfaces instead of using cooking spray, and reducing the temperature a bit as compared to the egg rolls. It worked like a charm and will be how I will bake my egg rolls or other "roll" recipes utilizing egg roll wrappers. And of course, if these meats and veggies don't correspond with your family's taste, you can always adjust accordingly. Just make sure to chop/cut them up small. And if you decide to use mushrooms or other veggies that harbor water, be sure to saute them for a few minutes as I did with the bell pepper and onion. · Spray a frying pan with butter-flavor nonstick cooking spray and heat over medium or medium-high heat. · Add bell pepper and onion and sprinkle with salt and pepper; saute for 2-3 minutes -- just long enough to sweat any water out of them. Cool completely. 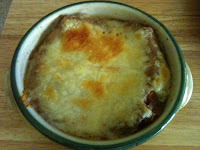 · Combine onion/pepper mixture, sausage, pepperoni, cheese and sauce; mix thoroughly. 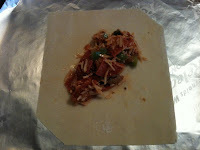 · Place completed egg roll seam side down on a baking sheet that has been lined with foil (preferably non-stick). · JUST before baking, coat your hands with olive oil; run your hands over all sides of each roll to coat, and then place it back on the foil-lined baking sheet. You will need to re-coat your hands frequently. · Bake for 12-14 minutes or until pizza rolls are brown.